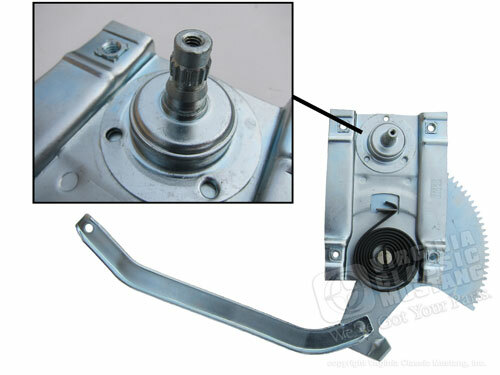 1965-66 Mustang Window Regulator (LH Driver's Side) for screw on style window handle. Scott Drake Brand-The best ones available! Silver cadmium plated to prevent rust. Engineered for a perfect fit. Will not self destruct like others. These are the finest available. They feature original metal thickness on body, large gear and swing arm, high tension spring to ease in operation, correct threads, splined shaft, exact dimensions as original for proper handle alignment, extra strong internal gear with improved rivets. 2 year warranty.